2013 -31ft Aspen Trail Travel Trailer. Three slides; large bunkhouse with entertainment unit and table; large living area with island and slide in kitchen; queen bedroom; full size shower in bathroom; outside kitchen; power awning and jacks. $22000 obo. 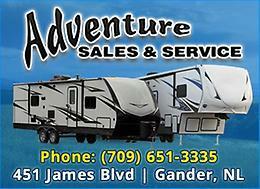 2014 RESIDENCE TRAVEL TRAILER in EXCELLENT condition. Contains 1 bedroom and 2 swivel recliner chairs. Large inside. $35,900.00 Will consider trades. Also 1 12 x 16 shed to be removed or stay on site subject to Park Manager if buyer has a site in Gushue's Pond. $2000.00 OBO. 709-691-2455 or 709-745-1413 (Bill). Respond by phone or text as I am posting for the seller. 35ft 2in 7283lbs Features front queen master with overhead cabinets, night stands & wardrobe slide, corner shower with glass doors & skylight, double sink with covers, Corian countertops, 22” range with glass bi-fold cover, rangehood, 1.3 cu ft microwave, 6 cu ft fridge with wood door panels, free standing table & chairs, tri-fold sofa, TV, fireplace, 2 power awnings, power stabilizer jacks& tongue jack. Finance for $125 biweekly tax in. 2015 Wildwood 31KQBTS travel trailer with three slides, outside kitchen, and u dinette. Loaded with upgraded features such as power stabilizer jacks, stainless steel kitchen package, leather interior package, A/C, TV, outside shower, power awning with LED light strip, power front jack and outside speakers. Zinger ZT32QB Travel Trailer with Bunkhouse and slide. Fibreglass siding, power awning, outdoor shower, BBQ and pass-through storage. Weight distribution hitch included. Sleeps 10. In excellent condition. 2002 Coachman 28 ft. Travel trailer. Good condition everything in good working order. Sleeps 6. Slight water damage in front corner. SOLD! 30 Ft Puma Travel Trailer with a queen size bedroom and 2 single bunks in back. Trailer can stay st the park where she is or can be parked elsewhere. Not suitable to move and travel around with it on daily basis. Travel can be seen at Birchy Narrows Travel Trailer Park near Birchylake on the Trans Canada highway. Lot size is 35 by 105 feet which also contains and included in sale is a shed, cookhouse, outdoor bathroom, outdoor shower, batteries for solar power plus much more. Ready to occupy. Interested parties e-mail for more information. 2016 Surveyor 295QBLE travel trailer with bunk house. This floor plan has a master queen bed and four single bunks. Features include outside kitchen, u dinette, stainless steel kitchen package, DVD/CD with outside speakers, power awning and power tongue jack. Lightweight aluminum frame and fibreglass exterior construction. Finance for only $125 biweekly tax included.